Great Hall event on 15th October acknowledges the contribution of the world's first computer programmer. On 15th October, City University London will play its part in celebrating the achievements of the world's first computer programmer, Ada Lovelace. Born Ada Gordon in 1815, Ada Lovelace was the only child of poet Lord Byron and his wife Annabella Milbanke. Fascinated with machines, she was taught science, logic and mathematics from an early age and designed boats and steam flying engines. In 1833, Lovelace was introduced to mathematician Charles Babbage. 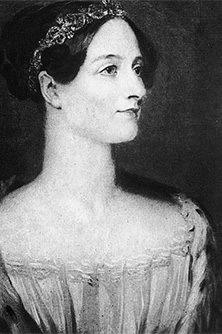 Between 1842 and 1843, she translated an article by Luigi Menabrea on Babbage's general-purpose computer, the Analytical Engine. She supplemented her translation with notes containing what is considered to be the first ever computer program - an algorithm encoded for processing by a machine. Taking place in City's Great Hall, from 5:30pm, City's celebration of Ada Lovelace will acknowledge the contribution of this distinguished scientist and technologist to science, engineering, technology and mathematics (STEM) and the strides women continue to make in what still remains a male-dominated arena. There will also be personal stories and reflections on the role of women in today's technology industry and a Q&A session. One of the highlights of the City celebration will be the panel discussion, from 6-7pm, entitled, "The only woman in the room: 1800s computer programmer to today's tech women". The discussion will focus on the role of women in technology today. Panellists include Connie St Louis (Panel chair and Senior Lecturer/Director, City Science Journalism MA program); Dr Arti Agrawal (Lecturer in Photonics in the School of Engineering & Mathematical Sciences); Louisa Kiwana (Research Executive, Engineering UK); and Prim Smith (Change & Implementation Manager, Camden City Council). The discussion will be preceded by an interactive activity fair featuring programming games, a mini campus tour and a 3D printer demonstration. "City University London is very keen to promote women studying STEM subjects and the exciting careers which such study can enable. The mathematician Ada Lovelace conducted pioneering work on Charles Babbage's analytical engine in the 19th century. She is now seen as the first computer programmer, constructing, for example, algorithms to compute Bernoulli numbers (an important sequence of rational numbers). We are absolutely delighted to be involved in celebrating Ada's extraordinary legacy." Please register here to attend City's Ada Lovelace celebration on 15th October.